Apartment in a residential and very quiet area, overlooking the sea with a comunitary splendid flowers garden, barbacue and swiming pool. Very easy parking. Free Wi-Fi. We had an excellent holiday in Blanes greatly due to the apartment, it's location beside beautiful beaches together with Francisco's hospitality and professionalism. The apartment was very well presented and equipped with everything we required. We would certainly recommend this accommodation. Dan & Christine F.
Wonderful location, beautiful place, fantastic sea & pin forest view , very comfortable Appartment and hospitable owner of the property - Francisco! He is very nice helpful person. He gave us a lot of interesting and useful information. If we had any question he was ready to help right now! We felt on holiday as at home. Strongly recommend this place! The property fully lived up to expectations. In fact, there are two bathrooms, not one as stated in the description. 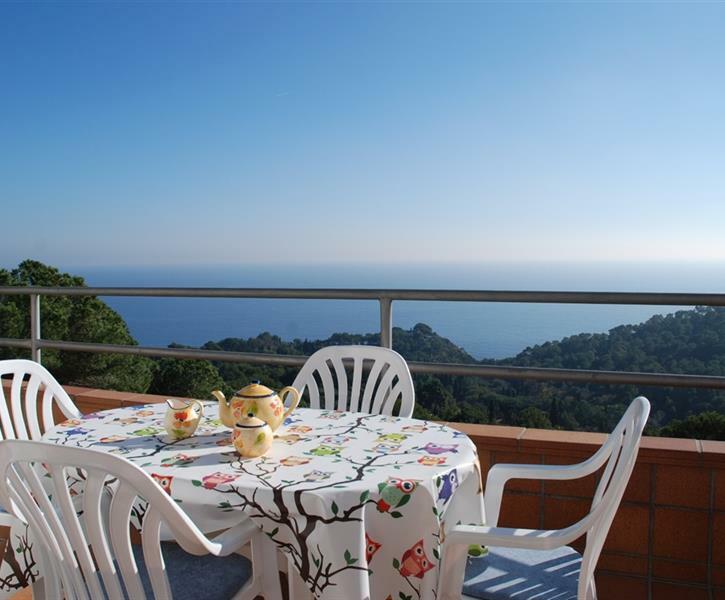 Santa Cristina is a quiet and peaceful oasis, just far enough from the bustle of Blanes and Lloret. Four good beaches within walking distance for reasonably active guests. With three botanical gardens within a couple of kilometers nature lovers will be well satisfied (you need to like cacti to appreciate Pinya de Rosa, but Mar i Murtra and Santa Clotilde are a delight) A big plus is the railway station in Blanes, with regular trains to Barcelona, just 30 mins journey time from Blanes - a hassle- free day trip to Barcelona. You do really need a car if you plan to visit the local area. Francisco was very helpful, but never intrusive.